Yay! An animated GIF of Futa, the walking red panda! Saturday saw a very special treat, with patch_bunny bringing along a VHS copy (indeed, it only appears to've seen a DVD release in France so far, and that only at the start of 2004) of Marquis, a film you're probably not going to see as part of the official Further Confusion video show any time soon. ^_^ Highly recommended. Today's video joy is one I should've highlighted long ago.. The Real Tuesday Weld's Bathtime in Clerkenwell (5.4MB). Catchy tune, highly nifty silhouette animation. Sort of furry, too. Well, feathery. I thought austin_dern might enjoy this example of broken English. 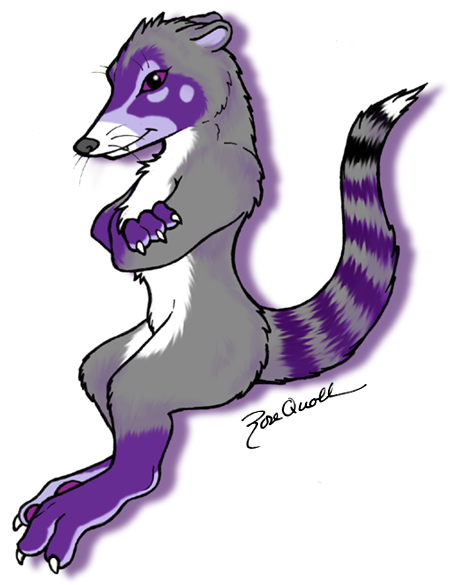 And rosequoll's even making a coati! Currently, it's looking like a July 25 2006 release for the first Animaniacs and Pinky and the Brain DVD boxes, with around 22 episodes each set. Heh. To think I interviewed with the company responsible for Sony's Windows rootkit.. they were quite proud of their close ties to Sony. With luck, the fallout from this wretched episode will be sore enough to dissuade any other potential corporate perpetrator. Perhaps it'll finally clue in some more people that this style of thinking has little to do with preventing "piracy". You know... I never made that connection re: my hard drive and Bender's! Heh. I'm just moving some music from my library onto the new Treo 650. I *would* take it straight from my hard drive, but I can't get the work laptop (xP) to see it for some reason. It shows up fine everywhere... except the "My Computer" folder. I'm sure there's something I should be doing to mount it... or maybe it's not seeing the files because the drive's formatted for Mac? Hmm. I may head down to Muddy Waters in a few minutes to see if you're there... or I'll call. Or something. I'll bring the stuff you left at my place. Does the Treo show up as an HFS+ volume, rather than something like FAT32 or NTFS? I'll see what Hyzenthlay thinks. What? the skywalk would have safety rails? I guess it would be cool....sigh. D'oh! I completely forgot about that. ^_^; Okies, I'll link to the image instead. Thanks! This is too, too freakin' CUTE!!!!!! Is there a full size screen shot available???? LUCKY YOU! Take tons of pics and send me a zip file loaded with them. >"^_^"
Having just seen Marat/Sade performed by vircoo and friends last night, and having commented to kaysho that lately all the haute-culture we've been exposing oursleves to lately has been involing the French Revolution, this is a perfect next-step. I think I'll be winding up with a copy, for one. ^_^ Definitely quite a.. memorable movie. Wow, that was the production the innocent 'roo was involved in? Hee! I'm going to have to find out if someone taped a performance. I'm pretty sure they showed this at either CF7 or CF8. I know I saw it with furries somewhere. He's a nice fellow, but I finally dropped him off my friends list because I got tired of the constant embedding of 1x1 tracking GIFs so he could tell who'd read behind the cuts, etc. Goodness! How did you ever find such a thing? Other than digging through the page source. It's not something I would have suspected to look for. I guess he could get IP addresses and hit-counts that way, but most people don't have a static IP address. It would be hard to link one address to a specific person. How did you ever find such a thing? Actually, it was 2×2 and bright red—he could hardly miss it. Most ISP's hand out addresses from small localized pools (AOL, British Telecom, and Sprint being notable exceptions). If I know you live in Podunk, and none of my other friends do, any IP address from your ISP's pool for Podunk is probably you coming to visit me. I'll look, but I don't think so. Robert King almost certainly will have a copy. He'll probably be at CF. Come to think of it, assuming it was given the all-clear by the CF folks, it might be fun to digitise some of that "early" footage and post it on the net.. Very good idea about contacting Robert - I'll drop him a line, and see if I might be in luck. Now, why aren't there any films about vampire red pandas, turning unwary humans into more of themselves? I say we remedy the matter. Wow, that Bathtime in Clerkenwell video was really cool! I've got to try finding a high quality version of it! Definitely a classic. I found a 15MB QuickTime file of it that seems quite perfect at http://www.figlimigliproductions.com plus 4 other movies. Oh, finestkind! Thanks! ^_^ I scurried over immediately to fetch all the videos linked there, save for the first listed, which seems to be on vacation at the moment. I'll be sure to link to said animator's site in my next entry.